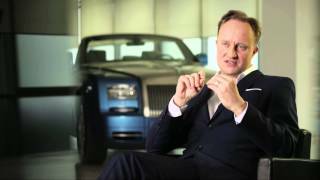 Rolls Royce, the name is enough to define luxury and to share the level of commitment someone can give to serve the best in automotive industry. A new redesigned version of 35 Phantom Drophead Coupes gets themselves drenched in this new saga and were introduced as Rolls Royce Phantom Drophead Coupe Waterspeed Collection 2014. Paying tribute to legend from late 1930s it features beyond-comparison standards inside and out. 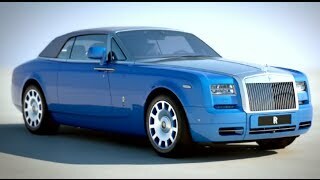 Let us have a look at the review of Rolls Royce Phantom Drophead Coupe Waterspeed Collection 2014 to know more. Back in the year 1937 dated 1st September; Sir Malcolm Campbell rumbles the waves with his Bluebird K3 hydroplane boat by achieving the top speed of 126.32 mph. This isn’t all, major reason behind the release of Rolls Royce Phantom Drophead Coupe Waterspeed Collection 2014 is that the engine powering this boat was Rolls Royce R-Type and it was this achievement over Lake Maggiore that reaffirmed the superiority of engines. The achievement and quality got stronger when the very next day he took it to whooping 129.5 mph and thus creating new world water speed record. 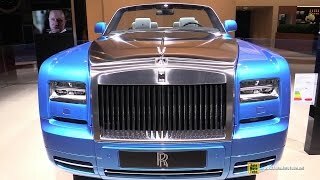 This is why to celebrate and pay tribute to the legend Rolls Royce decided to unveil Rolls Royce Phantom Drophead Coupe Waterspeed Collection 2014, a bunch of gorgeous, luxurious and expensive cars. 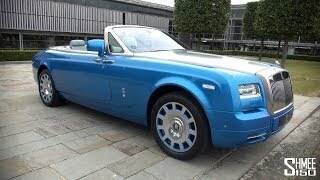 The Rolls Royce Phantom Drophead Coupe Waterspeed Collection 2014 comes covered with nine layers of thick and hand-sanded body paint, ‘Maggiore Blue’. 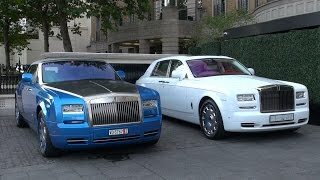 The essence of the same spreads vast and covers the entire body of Rolls Royce Phantom Drophead Coupe Waterspeed Collection 2014 till the engine. This integration makes model to be one-of-its-kind from the company with such amalgamation of serenity. Not only this, each and every metal piece before getting attached to car, gets polished after being hand-beaten for the right shape and shine. Moving towards the interior of Rolls Royce Phantom Drophead Coupe Waterspeed Collection 2014 you’ll experience the true magic and will get acknowledged to Rolls Royce’s saga of paying tribute. Door-armrests get hand-made metal endcaps which amazingly complement the Abachi wood inserts over the rest of part. Interior of Rolls Royce Phantom Drophead Coupe Waterspeed Collection 2014 gets the same coloring throughout as in the exterior. To remain with the theme and the concept behind introducing this model, company has integrated some parts which resemble to those found in boat. The sequence begins with ‘power reserve’ gauges, yellow and blue ‘redline’ indications and unique embroidery over headrests.